A woman who was abused as a child by her foster parents has won a Supreme Court battle against the local authority responsible for her care. The court ruled Nottinghamshire County Council "vicariously liable" for the abuse after placing Natasha Armes with two foster couples in the 1980s. Lawyers acting for Ms Armes, who the court decided could be named, described the result as a "landmark" ruling. The council said the findings will have "far-reaching implications" in the UK. The court heard Ms Armes, now aged 40, was physically and emotionally abused by Glenys Allison in her first placement, and sexually abused by Mark Blakely in the second. Ms Armes, from Nottingham, had been in foster care from the age of seven to 18. She had previously lost her claim against the authority, at the High Court and Court of Appeal. In the latest hearing, the judges ruled that the council could be held liable in respect of the physical and sexual abuse by carers, despite being found not to be negligent in connection with the selection or supervision of them. Colin Pettigrew, of the county council, said: "Ms Armes should have been safe in the care of her foster carers 30 years ago and she wasn't, this is a matter of huge regret to us. "This Supreme Court determination will have far-reaching implications for us and every other local authority across the land which has children's social care responsibilities." Lawyer Kim Harrison, who represents victims of foster care abuse, said the judgment finally puts right a "terrible injustice". 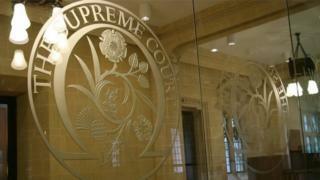 Having ruled in her favour, the justices told Ms Armes the next stage of the litigation was for damages to be assessed. The BBC has asked Nottinghamshire Police if it will investigate the abuse. A police spokesperson said: "We will review the findings of the Supreme Court ruling; however, any decision to take action has to be taken in line with the victim's wishes."